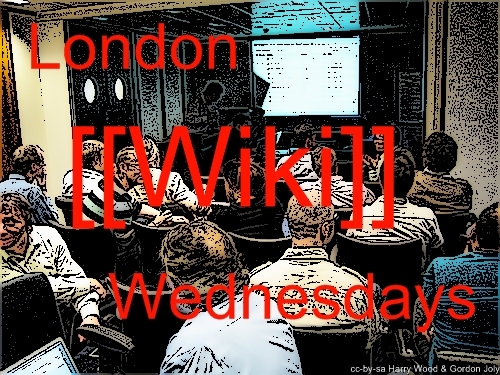 We had another London Wiki Wednesdays this week. For me a strange kind of circle was completed. 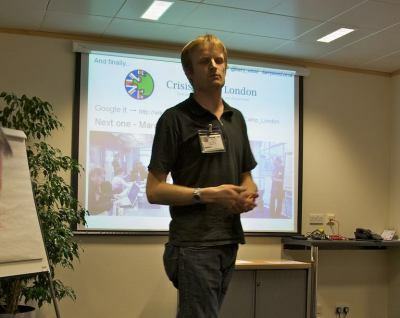 Back in October 2009 I blogged about how London Wiki Wednesdays had helped open my eyes to more interesting possibilities for working with fun technology. At the time I’d just quit a more dull/frustrating job, in which I worked as a Tibco consultant. Tibco do big expensive “enterprise” integration software for banks telcos and other big business. Not particularly fun technology. So it was weird to hear Tibco’s name come up in relation to “social media”, as David Terrar talked about their new Tibbr platform. I gave a talk, and rather enjoyed turning my attention back to wikis and away from OpenStreetMap and all things geo for a change. Rather like OpenStreetMap, which is always delightfully intertwined with “the real world”, I find it quite easy to imagine ways of collaborating on wikis in relation to almost any facet of real life. That’s something I chose to demonstrate with my talk. 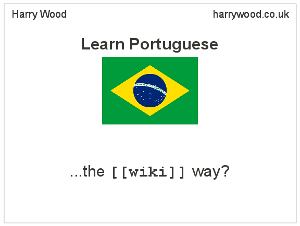 I wanted to tell a fun little story of dipping into wiki collaborations and wikibooks.org as I aimed to learn Portuguese. It’s a true story. A very short story (good for a 5 minute speaking slot!) and it sort of ends with this discussion here. …so far at least. If you want to be involved in what happens next, join that discussion I guess. …I also hope to find time to actually learn some Portuguese! There’s a full list of presentations and links to other blogs posts etc related to last Wednesday’s event. 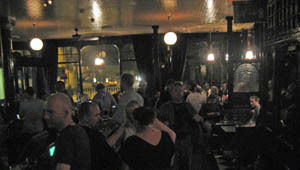 They’ll be a london wiki wednesday pub meet-up next month, and hopefully another evening of presentations in April. Last week we had a London Wiki Wednesdays event, and this time I was involved helping to organise and promote it. You can read what happened here (including lots more pics) The event was hosted by NYK line thanks to Alek Lotoczko. Alek along with me, Gordon, and Andrew managed to prod David Terrar enough times to get things moving in advance and get the event off the ground. I did some facebook messages and also created a twitter account, @LondonWikiWed, and went on a mass-following mission. All standard web2.0-social-media-promotion tactics. Sadly we’re still failing on a web1.0 level with google still sending people to a stale site which David Terrar is in charge of, and needs to sort out. The biggest thing we need to do for next time though, is sort out hosting and sponsorship in advance. As well as being the backup option for hosting, Alek very kindly forked out for some beers on the day, but we should try to find different sponsors next time. I set up some Sponsoring London Wiki Wednesdays information. A good promotion opportunity for someone I think. The event itself was great! Lots of interesting talks. I was particularly interested to learn a bit about Pfizer using semantic MediaWiki for a patent database (but I’m still not convinced that the added complexity is a good idea as part of a normal wiki). In fact on the second slide you can see the city point tower in the aerial imagery screenshot. 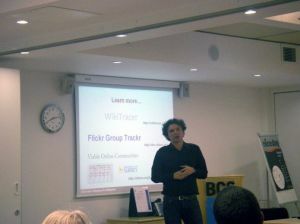 There was a series of monthly London Wiki Wednesdays events with presentations and networking chit-chat, all about wikis, blogs and social media technology, mostly as applied to enterprise use. Sadly they stopped happening back in 2008 ….but tonight they’re back! When I first went to Wiki Wednesdays a couple of years ago, I was massively enthusiastic about wiki collaboration in open content communities such as wikipedia, entirely for fun, as a hobby (though mostly pursued while bored at work). The events really opened my eyes to the possibility of working in this arena. I wanted a piece of this action. At the same time I was getting hooked on OpenStreetMap. Wiki-style collaboration to build a free map of the world. Since the last Wiki Wednesdays meet-up I’ve ditched my more dull I.T. job and got myself a job working full time on OpenStreetMap, so this evening I’m returning victorious! I’m going to give a talk about OpenStreetMap. The talks are only 5 mins, so hopefully they’ll be a bunch of other talks. Often these are about behind-the-firewall or b2b collaboration style uses. Should be good. 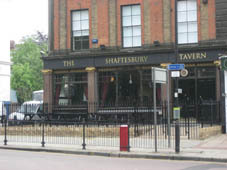 Hallelujahpraisethelord my local pub has re-opened! ….Update the details on deadpubsociety wiki. 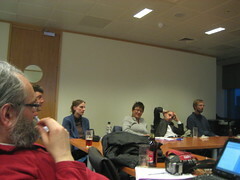 Last night’s London Wiki Wednesday was held at the BCS offices, and a load of BCS folk came along. They’re a funny old bunch, and judging by their comments, they found the wiki wednesday people rather odd too. I explained one detail of using wikipedia to somebody who had been experimenting with editing there. Basically I had to show him the finer points of picking through a wiki history display to figure out what had happened to his contribution. I guess this isn’t the easiest thing for a newbie to grasp. Interesting to follow through useability problems from a newbie’s point of view. 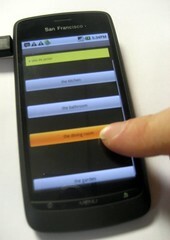 I wonder if there’s scope for interface innovation to make that easier. Someone had reverted his contribution, and explained why in their editing comment. Perhaps the thing which really went wrong here, was that the explanation was very brief and therefore unclear (the newbie didn’t even register that this was the explanation) Wikipedia these days is full of people who will revert edits in a somewhat cavalier manner, and this is surely putting off a lot of potential new contributors. On the flip-side though, wikipedia articles need to withstand a bombardment of sub-standard edits somehow. 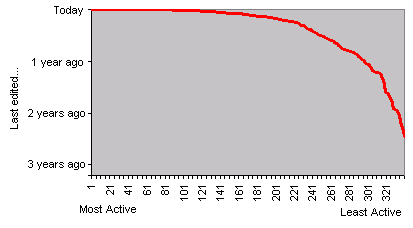 I guess “defenders” of wikipedia need to try hard to engage people with useful explanations about how to improve their contributions. Basically we should always assume good faith, but when faced with people pushing biased viewpoints or promotional links, engaging in conversation can be the last thing you want. Not an easy balance to strike, but I do think a lot of wikipedians are too harsh and disdainful with their reverting these days. It was good to meet Dario Taraborelli. If I was doing a PHD, I’d want it to be on topic like his. Interesting stuff! He showed us some of his work on wikitracer and analysis based on spidering to gather wiki metrics across many different wiki websites. This is something I’ve experimented with myself. More than two years ago now, I was practising my skills with ‘TIBCO BusinessWorks’, and created a web-scraping bot to generate a list of wikis by response time to help with early building of the database at wikiindex.org. Bots are fun! That reminds me. I need to fire up my more recent java creation again some time. The “most active london wikipedians” bot. Last week the London Wiki Wednesdays thing kicked off again, which I’m pleased about. I enjoyed this regular meet-up of wiki and web 2.0 enthusiasts. It was happening monthly for a while, but this is the first time we’ve managed to get together in 2008. Apparently David Terrar has been struggling to find people to host it, so if anyone knows anyone who has a big (~40 capacity) room with a projector, we’d love to use it (in exchange for appreciative blog links). Big thanks to David Terrar for managing to bring it together again, and special thanks this time since he paid for the food & drinks himself! I showed my appreciation by drinking all the booze and rambling to him on the tube on the way home! And thanks to Alek for hosting us again. 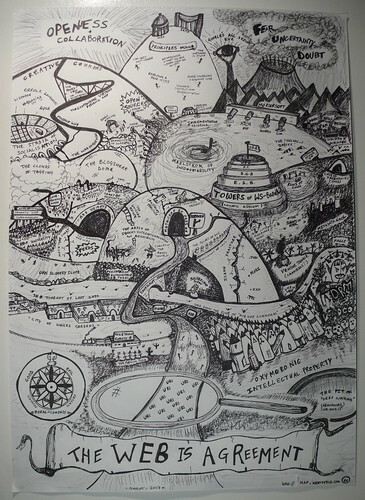 Andreas Rindler’s OmCollab looked interesting. It’s a blending of MediaWiki with WordPress and bookmarking tools. Some nice customisations, obviously including skinning, but also dropping in various extensions for added toolbar buttons, category tag clouds, easy attachments etc. Andy Roberts pointed out that wordpress is adding a ‘revisions’ feature, which is rather wiki-like. This kicked off a discussion about using wordpress as a wiki , whether it can be regarded as a wiki, and whether you want to use it that way. Without actually playing with it, it’s not clear whether it would support open editing, how it would relate with the “publish” button, or what would appear in RSS feeds. Personally I don’t expect wordpress to become a wiki. It is fundamentally a blogging tool, and this little revision feature does not represent a dramatic departure from that. But it is nod towards the wiki way of thinking, and this is exciting because wordpress is so extremely widespread, with a colossal installed-based. That’s a lot of users who may start to feel more comfortable when they see a history page in a wiki interface. People pointed out that this wordpress-wiki wouldn’t support wiki style links, that is, links which are (perhaps) created via some [[square brackets]] or CamelCAse, to create a new page by the same title, or to point to a potential new page. In my opinion this a defining feature of the wiki concept. It is the linking approach which allows wikis to function as a gloriously simple but powerful knowledge management tool, and can also lead to a characteristic wiki sprawling mess in the absence of careful wiki-gardening. Conventional HTML linking features won’t cut it, in my opinion. On the face of it, the only thing which matters about a wiki, is that you can edit a page really easily. But for me the wiki linking aspect cannot be dismissed.